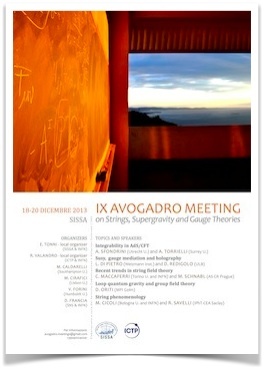 The Avogadro Meetings started in 2005 as an occasion for young Italian theorists, active in String Theory and related subjects, to gather and share their ideas and results in an informal atmosphere. The meeting took its name after the University of Piemonte Orientale that hosted its first three editions. It is usually scheduled in December, just before the beginning of the Christmas holidays, so as to simplify the participation of Italian Ph.D. students or postdocs working abroad, who can take the occasion of their travel back to Italy for Christmas and meet their young colleagues to exchange ideas and news on their activity. In order to stress the pedagogical aims of the meeting, preference is given to extended presentations on general themes rather than to conventional seminars on specific works, possibly organised and illustrated by more than one speaker and followed by a long discussion session. Consistently with the original spirit of the event the invited speakers are Italian; however, participation is open to anybody and non-Italians are welcome to join. For this reason the seminars are anyway presented in English.